The Ecumenical Patriarchate of Constantinople is the preeminent Church in the communion of the fourteen Autocephalous Orthodox Churches. Reflecting the witness of St. Andrew, the First Called Apostle, the enduring mission of the Ecumenical Patriarchate of Constantinople is to proclaim the salutary Gospel of Jesus Christ in accordance with the Apostolic and Orthodox Faith. The Ecumenical Patriarchate has a particular responsibility to strengthen the unity of the Orthodox Churches and to coordinate their common witness. At the same time, the Ecumenical Patriarchate has a specific responsibility to care for the faithful in lands beyond the borders of the other Autocephalous Churches. This is a ministry of service to the entire Church which the Ecumenical Patriarchate undertakes in accordance with the canons and often under difficult circumstances. The Faculty of Holy Cross Greek Orthodox School of Theology profoundly regrets that statements recently have been made which misinterpret the canonical prerogatives and distort historical facts related to the distinctive ministry of the Ecumenical Patriarchate. Indeed, some injudicious remarks have insulted the person of Ecumenical Patriarch Bartholomew and have attempted to diminish the significance of his ministry. These statements, made by bishops, priests and laity, have been widely distributed. Regretfully, they have done little to advance the cause of Orthodox unity and the witness of the Church today. Indeed, some observations have misrepresented the traditional basis of Orthodox ecclesiology. They contradict the admonition of St. Paul that “all things should be done decently and in order” (1 Cor. 14:40). The Church, chiefly through the Ecumenical Councils, has established significant principles of ecclesiastical organization. These principles are expressed in the canons of the Councils and in subsequent historical practices which have been sanctioned by the Church. These principles support the proclamation of the Gospel and strengthen the good order of the Church. The Ecumenical Patriarch has been accorded specific prerogatives of witness and service from the time of the fourth century. This was a period when the Church was able explicitly to provide for canonical structures following the period of great persecution of the first three centuries. These prerogatives form the basis for his ministry to the entire Orthodox Church. These prerogatives distinguish the responsibilities of the Ecumenical Patriarch from other bishops of the Orthodox Church. They clearly grant to the Ecumenical Patriarch of Constantinople a primacy among the bishops of the Church. This primacy of service brings with it significant authority and responsibilities. A number of recent commentators have challenged the leadership and responsibilities of the Ecumenical Patriarchate. They have misinterpreted canon 28 of the Council of Chalcedon (451), and related canons and practices. In order to appreciate properly the significance of canon 28 of the Council of Chalcedon, it must be interpreted in the light of other canons and practices of the Church at that time. It is far from being irrelevant as some may claim. The Second Ecumenical Council in Constantinople (381) in canon 3 acknowledged that the bishop of Constantinople enjoys “prerogatives of honor (presveia times).” While recognizing that the bishop of New Rome (Constantinople) ranked after the bishop of Old Rome, a parallel between the primatial positions of the two bishops was affirmed. At the Fourth Ecumenical Council in Chalcedon, the privileges of the bishop of Constantinople received further elaboration especially in canons 9 and 17. These canons stated that disputes in local churches could be appealed to Constantinople. Canon 28 of Chalcedon continued to draw a parallel between Old Rome and New Rome and reaffirmed the decision of 381. Canon 28 of the Council stated that the bishop of Constantinople had “equal prerogatives” (isa presveia) to those of Old Rome. Over two hundred years later, the distinctive position of Constantinople was also reaffirmed in canon 36 of the Penthekti (Quinsext) Council (in Trullo) in 692. This interpretation of canon 28 is supported by the fact that the geographical boundaries of the Local Churches are set. Their bishops are not permitted to minister beyond these limits. The Council of Constantinople in canon 2 clearly states: “Bishops should not invade churches beyond their boundaries for the purpose of governing them…” This principle is also reflected in canons 6 and 7 of the Council of Nicaea (325) and in the Apostolic Canons 14 and 34, also dating from the fourth century. The Church invested only the bishop of Constantinople with the responsibility to organize ecclesial life in the places not under the care of other Local (autocephalous) Churches. This is reflected, for example, in the missions to the Goths and Scythians in the fifth century. The pastoral and missionary activities inaugurated by St. John Chrysostom while Patriarch of Constantinople are especially instructive in this regard. One must also take note of the missionary activity of the Ecumenical Patriarchate in Central and Eastern Europe from the ninth under Patriarch Photios and later on through the sixteenth centuries. In these cases, the Ecumenical Patriarchate acted to spread the Gospel in territories beyond the boundaries of other Local Churches. The Ecumenical Patriarchate granted autocephalous status to the Church of Russia in 1589, confirmed in the Golden Seal Certificate in 1591, which was reaffirmed by a synod in Constantinople in 1593 when patriarchal status was granted. In these Tomes, the territorial jurisdiction of the Church of Russia was clearly defined. This practice was followed in the Tome of Autocephaly for all subsequent Autocephalous Churches which were granted their status by the Ecumenical Patriarchate and confirmed by the assent of the other Autocephalous Churches. "The Orthodox Church is an orderly community of autocephalous or autonomous Churches, while she is fully aware of herself as the authentic continuation of the One, Holy, Catholic and Apostolic Church. She fulfills her spiritual mission through the convocation of local or major Synods, as the canonical tradition has established it, in order to safeguard and affirm the communion of the local churches with each other and with the Ecumenical Patriarchate. The Ecumenical Patriarchate, as the First Throne in the Orthodox Church, has been granted by decisions of Ecumenical Councils (canon 3 of the II Ecumenical Council; canons 9, 17 and 28 of the IV Ecumenical Council; canon 36 of the Quinsext Ecumenical Council) and by the centuries-long ecclesial praxis, the exceptional responsibility and obligatory mission to care for the protection of the faith as it has been handed down to us and of the canonical order (taxis). And so it has served with the proper prudence and for seventeen centuries that obligation to the local Orthodox churches, always within the framework of the canonical tradition and always through the utilization of the Synodal system…"
History bears this out. It is attested to by innumerable examples of initiative undertaken by the Ecumenical Patriarchate to exercise leadership for those Local Churches prevented by unusual circumstances from doing so. In this capacity, the Ecumenical Patriarchate elected patriarchs for other Sees when asked, acted as arbitrator in disputes, deposed controversial patriarchs and metropolitans outside its territory, and served on many occasions up to the present as mediator in resolving issues of Pan-Orthodox concern. Especially important for the well-being of world Orthodoxy in recent times was the role of Ecumenical Patriarch Athenagoras in convening a series of Pan-Orthodox Conferences in 1961, 1963, 1964, and 1968 to address immediate issues requiring a Pan-Orthodox consensus, and to make preparations for the convocation of a Great and Holy Council. These Conferences marked the beginning of a new period of conciliarity among the Orthodox Churches. The Ecumenical Patriarchate acted with wisdom and love to draw the Churches out of their isolation so that they might address critical issues together. Numerous consultations have taken place since then to examine the ten themes which were proposed by the Churches in 1976 for study in anticipation of the convening of a Great and Holy Council. Among these themes was the topic of the Diaspora. When this conciliar process began in 1961, all the Autocephalous Churches recognized that it was the prerogative of the Ecumenical Patriarchate to lead this effort for the good of the entire Church. For over forty years, the Ecumenical Patriarchate has wisely led this conciliar process with the concurrence of the other Autocephalous Churches. In conjunction with this conciliar process, the distinctive initiatives of the Ecumenical Patriarch, with the collaboration of other Autocephalous Churches, have led to significant events in the life of the Orthodox Church. Among these are: the re-establishment of the Church of Albania (1992); the arbitration of disputed patriarchal elections in the Churches of Bulgaria (1998) and Jerusalem (2005); and the establishment of an orderly succession of the Archbishop of Cyprus (2006). In all of these cases the leadership of the Ecumenical Patriarchate was of singular importance. It was a leadership fully recognized by all the Autocephalous Churches. Far from acting in an arbitrary manner, Ecumenical Patriarch Bartholomew personally has profoundly contributed to the life of the Orthodox Church through his persistent efforts to deepen the sense of conciliarity and common witness among the Autocephalous Churches. In addition to the above developments, he has visited all the Autocephalous Churches and cultivated a personal relationship with their leaders. Most importantly, he has convened and presided at the historic Synaxis of Orthodox Primates in 1992, 1995, 2000, and 2008. "The Patriarch of Constantinople rejects any plenitudo potestatis ecclesiae and holds his supreme ecclesiastical power not as episcopus ecclesiae universalis, but as Ecumenical Patriarch, the senior and most important bishop in the East. He does not wield unrestricted administrative power. He is not an infallible judge of matters of faith. Always the presupposition of his power is that in using it he will hold to two principles: conciliarity and collegiality in the responsibilities of the Church and non-intervention in the internal affairs of the other churches…"
With these observations in mind, the following must be noted with regard to the distinctive primacy of the Ecumenical Patriarch. Firstly, all the Autocephalous Churches recognize the Ecumenical Patriarch as the ‘first bishop’ of the Church. He has specific responsibilities for coordinating a common witness among the Autocephalous Churches. As such, the Ecumenical Patriarch exercises this ministry first of all in relationship with the Holy Synod of the Ecumenical Patriarchate. The Patriarch is the president of this Synod. He does not act over or above the other bishops. According to the Orthodox perspective, primacy involves conciliarity. He always acts together with the other bishops of the Patriarchal Synod. Likewise, in his relationship with other Orthodox, the Ecumenical Patriarch is honored as the protos, the first bishop of the Church. This position gives to the Ecumenical Patriarch the special responsibility for identifying issues requiring the attention of the entire Church and for convening appropriate meetings to address these issues. When the Orthodox meet in a Synaxis, the Ecumenical Patriarch is the presiding bishop of the meeting. At the most recent Synaxis in Constantinople in October 2008, Ecumenical Patriarch Bartholomew proposed to the other Primates that renewed attention be given to the so-called Diaspora. A part of the process leading to the Great and Holy Council, representatives of the Autocephalous Churches had examined the topic of the Diaspora in 1990 and 1993, and made significant recommendations. As one of his proposals, Ecumenical Patriarch Bartholomew called upon the Churches to “activate the 1993 agreement of the Inter-Orthodox Consultation of the Holy and Great Council in order to resolve the pending matter of the Orthodox Diaspora.” This was a clear indication that the Ecumenical Patriarchate refused to accept indefinitely the present canonical irregularities in places such as the United States. Under the leadership of Ecumenical Patriarch Bartholomew, the Primates indicated that the status quo in the so-called Diaspora was not acceptable. The development of the Orthodox Church in the United States is very complex. The early growth of the Orthodox Church in this country has resulted from immigration, missionary activity, and the return of Eastern Catholics to Orthodoxy. In more recent decades especially, the Church also has received many persons who have found in Orthodoxy the fullness of the historic Apostolic Faith. Truly, the Orthodox Church in this country has become a salutary witness to Our Lord and His Gospel. Through its teachings, ecumenical dialogues and philanthropic activities, the Orthodox Church has contributed to the process of reconciliation and healing in our society. At the same time, it must be recognized that the proper development of the Church in this country has not always followed the principles of ecclesiastical organization reflected in the canons of the Councils which have already been mentioned. The presence of multiple jurisdictions from various Autocephalous Churches in the same territory and the presence of multiple bishops in the same territory are clearly contrary to the canonical tradition. The good order of the Church has been shaken by acts which have gone contrary to ecclesiological principles and historical praxis. Among these acts was the grant of ‘Autocephaly’ to the Russian Orthodox Greek Catholic Church (the Metropolia) by the Church of Russia in 1970, thereby renaming this jurisdiction the “Orthodox Church in America.” This action had no canonical basis. From that time, the Ecumenical Patriarchate and the majority of other Autocephalous Churches have refused to recognize the “autocephalous” status of this jurisdiction. As a result, this jurisdiction has not been accorded a place in global Pan-Orthodox discussions in accordance with the agreement of the Autocephalous Churches. Yet, the Ecumenical Patriarchate has exercised restraint and has not broken communion with this jurisdiction. Indeed, in the 1990s the Ecumenical Patriarchate frequently received representatives of this jurisdiction to discuss its irregular status. While recognizing the historical road of this jurisdiction, the Ecumenical Patriarchate has affirmed that the canonical irregularities have not been resolved. "It is truly a scandal for the unity of the Church to maintain more than one bishop in any given city; it clearly contravenes the sacred canons and Orthodox ecclesiology. It is a scandal that is exacerbated whenever phyletistic motives play a part, a practice soundly condemned by the Orthodox Church in the last century. The Ecumenical Patriarchate, as a supra-national Church serving the unity of the Church, is not indifferent to the condition that has evolved, and will exert every effort in cooperation with the other Holy Orthodox Churches, and in accordance with canonical order, to resolve this thorny problem." In order to address the difficult situation in America, the Ecumenical Patriarchate has consistently supported efforts aimed at increasing cooperation among the jurisdictions and at establishing proper order in accordance with the canons. Archbishop Athenagoras proposed a Conference of Orthodox Bishops in 1936. This proposal was the basis for the “Federation” which came into existence in 1943. Archbishop Michael convened a gathering of Orthodox bishops in 1952 with the intention of having regular meetings. Archbishop Iakovos led the establishment of the Standing Conference of Canonical Orthodox Bishops (SCOBA) in 1960. Since that time, the Exarch of the Ecumenical Patriarchate has served as the chairman of SCOBA in accordance with the agreements affirmed in the Pan-Orthodox Conferences. Moreover, it was under the leadership of the Exarch of the Patriarchate of Constantinople that meetings of all Orthodox bishops were convened in this country. Archbishop Iakovos presided at the meeting in 1994. Archbishop Demetrios presided at meetings in 2001 and 2006. Members of the Holy Cross Faculty have been actively involved in a number of initiatives of the Ecumenical Patriarchate aimed at addressing the canonical irregularities of church life in America. The Faculty of Holy Cross was invited in 1977 by the Ecumenical Patriarchate to submit a vision of unity for the Orthodox Church in the United States. The draft of this vision constituted one approach to the models of unity under study. Faculty members have been invited to participate in meetings related to the preparation for the Great and Holy Council. The present Dean of Holy Cross was involved in meetings of the Inter-Orthodox Preparatory Commission convened by the Ecumenical Patriarchate in Chambésy, Switzerland in 1990 and 1993 as well as a related meeting in 1995. We believe that the Ecumenical Patriarchate possesses distinctive prerogatives to serve the unity and witness of the entire Orthodox Church in accordance with the canons and the praxis of the Church. Since the fourth century, the Ecumenical Patriarchate has acted in accordance with the canons to maintain and strengthen the “unity of spirit in the bond of peace” (Eph. 4:3) among the Autocephalous Churches. Directly related to our situation in the United States is the interpretation of canon 28 of Chalcedon and related canons. Although it deals with a specific situation of its time, canon 28 nevertheless safeguards principles which constitute the basis of permanent aspects of our canonical tradition. Other canons do the same. One might consider, for example, canon 6 of Nicaea or canon 3 of Constantinople or canon 39 of the Penthekti (Quinsext) Council (in Trullo), among others. In the first instance, an established order of church government is confirmed; in the second, an adjustment of church order is made to accommodate a special need. In both instances, principles are provided which reveal the manner in which the Church expresses herself in different situations. So it is with canon 28 of Chalcedon. It confirms what in practice was already in progress at that time – a primacy of honor among equals for the bishop of Constantinople, expressed in a way which reflected this reality. While not diminishing the significance of canon 28 and related canons, the Ecumenical Patriarchate has wisely recognized the distinctive and complex features of Orthodoxy in the United States especially. The Ecumenical Patriarchate has recommended that a truly Pan-Orthodox solution must be found. It has advocated this perspective in recent Pan-Orthodox discussions. In light of canonical tradition and ecclesial praxis, the Ecumenical Patriarchate is alone in the position to guide the Autocephalous Churches toward a proper resolution for the Church in the United States. We rejoice that much is made of Orthodox unity and the role of the Ecumenical Patriarchate in achieving it. This is good and hopeful, in view of the fact that it keeps alive and at the forefront of our concerns the quest for this noble goal. At the same time, however, it raises, once more, the issue about the way in which this unity should be achieved. At the center of this discussion is our Mother Church, the Ecumenical Patriarchate, and the understanding of its role in initiating the process of the goal towards unity. 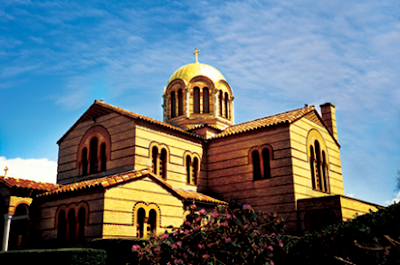 We look to the venerable Ecumenical Patriarchate to continue to lead the Autocephalous Churches in addressing the difficult challenge of the Orthodox Diaspora, especially here in the United States. The recommendations of the Inter-Orthodox Pre-Conciliar Consultations in Chambésy in 1990 and 1993, as well as the meeting there in 1995, provide significant proposals for addressing the irregularities of Church structures in the United States. We endorse the proposal of Ecumenical Patriarch Bartholomew to activate the 1993 agreement which proposed the establishment of an Episcopal Assembly in given areas. We look forward to meetings scheduled to take place this year to continue to examine the topic of the so-called Diaspora. We appeal to all, both clergy and laity, to pray for the unity of the Church and to commit ourselves to words and deeds of healing and reconciliation so that our good and loving God, Father, Son and Holy Spirit, will be honored and glorified. See, Lewis J. Patsavos, Primacy and Conciliarity: Studies in the Primacy of the See of Constantinople and the Synodical Structure of the Orthodox Church, Brookline, 1995. Ecumenical Patriarch Bartholomew, “Address to the Ukrainian Nation,” July 26, 2008. Metropolitan Maximos of Sardis, The Ecumenical Patriarchate in the Orthodox Church, Thessaloniki, 1976, p. 236. This outstanding study documents the historic role of the Ecumenical Patriarchate especially in relationship with the other Autocephalous Churches. Ecumenical Patriarch Bartholomew, Encountering the Mystery, New York, 2008, p. xl. Ecumenical Patriarch Bartholomew, “Address at the Synaxis of the Heads of Orthodox Churches,” Constantinople, October 10, 2008. “Message of the Primates of the Orthodox Church,” Constantinople, October 12, 2008. See, Thomas FitzGerald, The Orthodox Church, Westport, 1995, pp. 101-115. “Remarks of Patriarch Dimitrios,” The Orthodox Church 26:9/10 (1990), p. 9. See Lewis Patsavos, “The Harmonization of Canonical Order,” in Journal of Modern Hellenism, 19-20, 2001-02, pp. 211-28.